Baseball Hooded Towel Discounts Apply ! 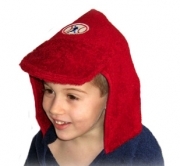 The Baseball Hooded Towel is a favorite of dads, as well as t-ballers and little leaguers! A great baby shower gift, this hooded towel is big enough for years (and years!) of use at bath time, swimming lessons, and at the beach. Save 10% when you buy two or more!